The list of The Tempest characters provide a convenient introduction to the William Shakespeare play summary of The Tempest. The male and female characters bring the plot of the play to life. Not only do we remember the stories but we remember the people - we all have our favourite characters. The following short summary of The Tempest provides a brief description of this famous William Shakespeare play. The story of the plot with its famous characters via the summary of The Tempest. Interesting facts and information about the Globe Theatre of Elizabethan London with a William Shakespeare Play Summary of The Tempest with a list of Characters. This drama is one of the great comedy plays by William Shakespeare. The themes illustrated in the play are freedom, friendship , repentance and forgiveness and feature different temperaments illustrating temperance and intemperance. The plot starts when King Alonso of Naples and his entourage sail home for Italy after attending his daughter's wedding in Tunis, Africa. They encounter a violent storm, or Tempest. Everyone jumps overboard and are washed ashore on a strange island inhabited by the magician Prospero who has deliberately conjured up the storm. 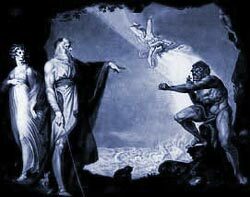 Prospero and Miranda live in a cave on the island which is also inhabited by Ariel, a sprite who carries out the bidding of Prospero, and the ugly, half human Caliban. Various plots against the main characters fail thanks to the magic of Prospero. The play ends with all the plotters repenting the Tempest is calmed. Interesting Facts and information about the Summary of The Tempest and Characters. Additional details, facts and information about the Globe Theatre and the summary and characters of other William Shakespeare plays can be accessed via the Globe Theatre Sitemap.